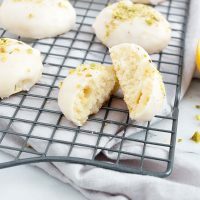 Soft, pillowy cookies, flavoured with lemon zest, topped with a zesty lemon glaze and topped with pistachios. In a large bowl with an electric mixer, or the bowl of a stand mixer fitted with the paddle attachment, beat the cooled, melted butter and sugar together, until light and fluffy, about 2-3 minutes. Add the eggs and beat together. Add the lemon zest and mix in. Add the dry ingredients and mix until combined. Cover bowl and refrigerate for 30 minutes. Meanwhile, line a large baking sheet with parchment paper. Set aside. Remove dough from fridge and working quickly (so dough stays cool), spoon out a heaping tablespoon and dough. Roll it into a ball between your palms, the press and roll gently to make a log about 3-ish inches long. Take the dough log and working on your baking sheet, coil it up, setting the outside end to rest slightly on top of the coil (sticking up a bit, rather than laying flat on the pan). Repeat with remaining dough, placing on baking sheet at least 2-inches apart. *If your dough gets warm and sticky to work with at any point (or between batches), simply cover and place back in the fridge for a few minutes. Once your baking sheet is full of formed cookies, place the cookie sheet with the cookies into the fridge for 15 minutes. When cookies have chilled, place into preheated oven and bake for 12-14 minutes, or until set and lightly golden on the bottom and outside edges. Let stand on the baking sheet for 1 minutes, then transfer to a cooling rack to cool completely. Place a big piece of parchment paper under your cooling rack to catch drips and for easy clean-up. Prepare glaze by combining icing/confectioner's sugar with lemon juice until you have a glaze that will fall off a spoon, but not too thin that it looks like it would immediately run off the cookies. Using a spoon, drizzle generous spoonfuls of glaze over cooled cookies, coaxing it towards bare areas as needed, until the entire top of the cookie is covered. Once you have done 3 or 4 cookies, stop and sprinkle on the pistachios or other topping you are using, so they will stick to the glaze before it hardens. The glaze will set up by itself if left undisturbed on the countertop, but I like to pop them into the fridge to set up more quickly. Once the glaze has set, transfer to a cookie tin and store at room temperature. *To get 1/2 an egg, simply take 1 egg and beat it lightly with a fork in a small bowl, then use just 1/2 of it.